This article is about the French artist. For other uses, see Doré (disambiguation). Paul Gustave Louis Christophe Doré (/dɔːˈreɪ/; French: [ɡys.tav dɔ.ʁe]; 6 January 1832 – 23 January 1883) was a French artist, printmaker, illustrator, comics artist, caricaturist, and sculptor who worked primarily with wood engraving. 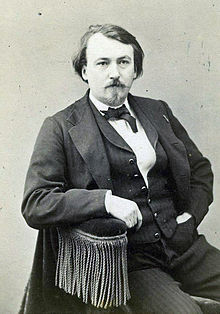 Doré was born in Strasbourg on 6 January 1832. By age 5 he was a prodigy artist, creating drawings that were mature beyond his years. Seven years later, he began carving in stone. At the age of 15, Doré began his career working as a caricaturist for the French paper Le journal pour rire. Wood engraving was his primary method at this time. In the late 1840s and early 1850s, he made several text comics, like Les Travaux d'Hercule (1847), Trois artistes incompris et mécontents (1851), Les Dés-agréments d'un voyage d'agrément (1851) and L'Histoire de la Sainte Russie (1854). Doré subsequently went on to win commissions to depict scenes from books by Cervantes, Rabelais, Balzac, Milton, and Dante. He also illustrated "Gargantua et Pantagruel" in 1854. In 1853 Doré was asked to illustrate the works of Lord Byron. This commission was followed by additional work for British publishers, including a new illustrated Bible. In 1856 he produced 12 folio-size illustrations of The Legend of The Wandering Jew, which propagated longstanding antisemitic views of the time, for a short poem which Pierre-Jean de Béranger had derived from a novel of Eugène Sue of 1845. In the 1860s he illustrated a French edition of Cervantes's Don Quixote, and his depictions of the knight and his squire, Sancho Panza, have become so famous that they have influenced subsequent readers, artists, and stage and film directors' ideas of the physical "look" of the two characters. Doré also illustrated an oversized edition of Edgar Allan Poe's "The Raven", an endeavor that earned him 30,000 francs from publisher Harper & Brothers in 1883. Doré's illustrations for the Bible (1866) were a great success, and in 1867 Doré had a major exhibition of his work in London. This exhibition led to the foundation of the Doré Gallery in Bond Street, London. In 1869, Blanchard Jerrold, the son of Douglas William Jerrold, suggested that they work together to produce a comprehensive portrait of London. Jerrold had obtained the idea from The Microcosm of London produced by Rudolph Ackermann, William Pyne, and Thomas Rowlandson (published in three volumes from 1808 to 1810). Doré signed a five-year contract with the publishers Grant & Co that involved his staying in London for three months a year, and he received the vast sum of £10,000 a year for the project. Doré was mainly celebrated for his paintings in his day. His paintings remain world-renowned, but his woodcuts and engravings, like those he did for Jerrold, are where he excelled as an artist with an individual vision. The completed book London: A Pilgrimage, with 180 engravings, was published in 1872. It enjoyed commercial and popular success, but the work was disliked by many contemporary critics. Some of these critics were concerned by the fact that Doré appeared to focus on the poverty that existed in parts of London. Doré was accused by The Art Journal of "inventing rather than copying". The Westminster Review claimed that "Doré gives us sketches in which the commonest, the vulgarest external features are set down". The book was a financial success, however, and Doré received commissions from other British publishers. Doré's later work included illustrations for new editions of Coleridge's Rime of the Ancient Mariner, Milton's Paradise Lost, Tennyson's Idylls of the King, The Works of Thomas Hood, and The Divine Comedy. Doré's work also appeared in the weekly newspaper The Illustrated London News. Doré never married and, following the death of his father in 1849, he continued to live with his mother, illustrating books until his death in Paris following a short illness. The city's Père Lachaise Cemetery contains his grave. At the time of his death in 1883, he was working on illustrations for an edition of Shakespeare's plays. The government of France made him a Chevalier de la Légion d'honneur in 1861. Doré illustrated several fairy tales: Cendrillon (or Cinderella). Don Quijote illustrated by Gustave Doré. Don Quijote illustrated by Gustave Doré, another one of the 500 pieces Doré created for the work. ^ Lyons, Martin (2011). Books: A Living History. Los Angeles: Getty Publications. p. 135. ISBN 978-1-60606-083-4. ^ Complete Works of Lord Byron illustrated by Ch. Mettais, Bocourt, G. Doré. Published by J. Bry, Paris, 1853. The version at archive.org is in French. The illustrations are not attributed to any one of the three named on the title page. A handwritten note at page 5 remarks that another edition of 1856 made no mention of Doré among the illustrators, but his designs still appeared in the book. ^ "eBay". 22 January 2013. Archived from the original on 22 January 2013. ^ "Willis's Price Current: A Catalogue of Superior Second Hand Books Ancient and Modern ... to which are Added a List of New Publications and Current Notes for the Month". Willis and Sotheran. 21 January 2018 – via Google Books. ^ McQueen, A. "Gustave Doré," in Nineteenth-Century Art, Highlights from the Tanenbaum Collection, London: 2015, p. 54. ^ "Introduction to The Microcosm of London (1808-10) – Romantic London". www.romanticlondon.org. ^ Ackyroyd, Peter (2005). London: A Pilgrimage (introduction). Anthem Press. pp. xix. ^ Chapman, J (1873). The Westminster Review, Vol 99. p. 341. ^ Stuthehistoryguy. "Gustave Doré". Findagrave. Retrieved 12 November 2016. ^ Lyons, Martin (2011). Books: A Living History. J. Paul Getty Museum. p. 135. ^ David Kunzle (1983). "Gustave Dore's History of Holy Russia: Anti-Russian Propaganda from the Crimean War to the Cold War". The Russian Review. Russian Review, Vol. 42, No. 3 (Jul., 1983), pp. 271-299. 42 (3): 271–299. doi:10.2307/129823. JSTOR 129823. ^ Eleanor Garvey, A Catalogue of an Exhibition of the Philip Hofer Bequest, 1988. ^ Roosevelt, Blanche: "Life and Reminiscences of Gustave Doré. ", page 183. Cassell & Company, Limited, New York, 1885. ^ Roosevelt, Blanche: "Life and Reminiscences of Gustave Doré. ", page 179. Cassell & Company, Limited, New York, 1885. ^ a b c Roosevelt, Blanche: "Life and Reminiscences of Gustave Doré. ", page 207. Cassell & Company, Limited, New York, 1885. ^ Roosevelt, Blanche: "Life and Reminiscences of Gustave Doré", pages 215. Cassell & Company, Limited, New York, 1885. Roosevelt states that "In Doré's catalogue 'L'Inferno' figures amongst the works of 1857, and I shall therefore speak of it as belonging to that year's collection, although it was not brought out until 1860." ^ Roosevelt, Blanche: "Life and Reminiscences of Gustave Doré", pages 212-227. Cassell & Company, Limited, New York, 1885. ^ a b c d e f g h i j k l m n o p q r s t u v w x y z aa ab ac ad ae af ag ah ai aj ak al am an ao ap aq ar as at Roosevelt, Blanche: "Life and Reminiscences of Gustave Doré", pages 241-243. Cassell & Company, Limited, New York, 1885. ^ Roosevelt, Blanche: "Life and Reminiscences of Gustave Doré", pages 63. Cassell & Company, Limited, New York, 1885. Gustave Doré, Edmond About, and H. Taine were more than contemporaries: they knew each other from college. Roosevelt quotes Doré, "...from that date  until 1850, I occupied myself—sometimes well and sometimes badly—in finishing my studies at the Lycée Charlemagne. It was there that I was so fortunate as to have Edmond About and H. Taine for fellow-collegians." ^ Roosevelt, Blanche: "Life and Reminiscences of Gustave Doré", pages 241. Cassell & Company, Limited, New York, 1885. Roosevelt attributes authorship to "Malted": "'Les États Unis et la Mexique,' by Malted (sic) (Brun, Paris, 1862), 1 vol. in 4to." She is most likely referring to either Conrad Malte-Brun or his son, Victor Adolphe Malte-Brun, both noted French Geographers. ^ Opie, Iona and Peter. The Classic Fairy Tales. 1974. Oxford University Press. p. 134. ^ Roosevelt, Blanche: "Life and Reminiscences of Gustave Doré", page 242. Cassell & Company, Limited, New York, 1885. Roosevelt implies, though does not specifically state, that a French publisher published this volume in 1865. For one, she places this reference with the other books published in 1865, for another, she uses the word also when mentioning that Sampson Low brought out a copy in London in 1866. Additionally, an English publication would most likely be translated and have a title of Toilers of the Sea. Roosevelt's line reads thus: "Victor Hugo's 'Travailleurs de la Mer', also in 1866, brought out by Sampson Low and Co., in London." ^ Although Blanche Roosevelt lists this book as being published in 1866, here Image:Le chemin des ecoliers title page.jpg is the title page of an edition published five years earlier, with Gustave Doré drawings. Roosevelt is most likely mistaken. ^ Roosevelt, Blanche: "Life and Reminiscences of Gustave Doré", page 242. Cassell & Company, Limited, New York, 1885. Roosevelt titles this book "The Song (sic) of the Ancient Mariner". The error possibly derives from reverse-translating the French title (Le Chanson du Vieux Marin) back into English. ^ Roosevelt, Blanche: "Life and Reminiscences of Gustave Doré. ", page 488. Cassell & Company, Limited, New York, 1885. Wikimedia Commons has media related to Gustave Doré.